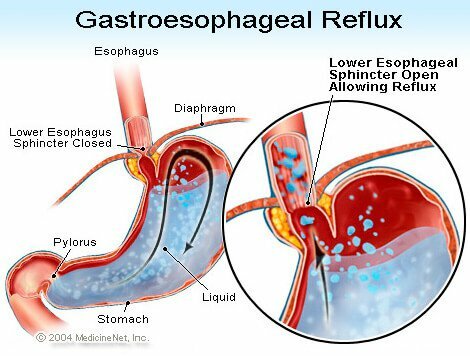 Acid reflux or gastroesophageal reflux disease (GERD) is a condition whereby stomach acid flows back to the food tract (esophagus). This irritates the lining of the esophagus. There are mild cases of GERD that people can easily cope with using over the counter medication and a change of lifestyle. However, there are severe cases that may require surgery or stronger medications. When food is swallowed, the lower esophageal sphincter (circular muscles at the bottom of the esophagus) relaxes to allow food and liquids to enter into the stomach. Once the swallowing is through, the sphincter closes. The stomach acid therefore flows back to the food duct because the sphincter is weak or it relaxes abnormally. Constant acid refluxes irritate the esophagus and may lead to its inflammation. Esophageal stricture. Stomach acid damages the lower part of esophagus leading to formation of scar tissue. The scar tissue narrows the esophagus, leading to swallowing problems. Esophageal ulcer. The stomach acid wears out esophageal walls forming open sores. These ulcers cause a lot of pain, bleed and make swallowing hard.